Canon 70D was released for two purposes: to update its aging predecessor, Canon 60D, and to respond against Nikon D7100. This is very apparent from the fact that Canon 70D also uses an APS-C image sensor and is aimed specifically at enthusiasts looking for a step up from entry-level models. So, between Nikon D7100 vs Canon 70D, which one does give the better value and performance? Continue reading below for the answer! 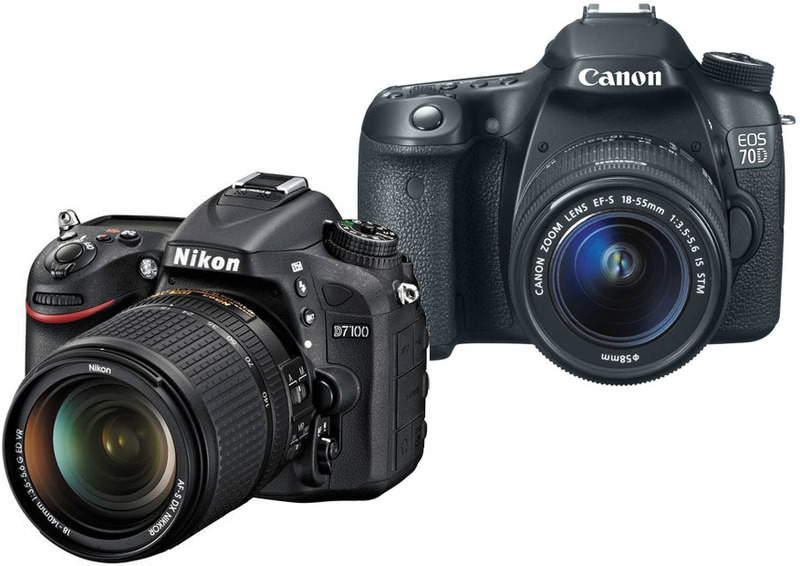 Both Nikon D7100 and Canon 70D look exactly like what you would expect from an enthusiast-grade DSLR camera. For sure, they are both larger and heavier than the entry-level models. But they are still quite portable and comfortable to carry around, if you compare them to the professional models. Nikon D7100 is a little bit smaller yet heavier than Canon 70D, but the differences are very marginal. Both models have weather-sealed bodies, so they are ready for outdoor uses. Nikon D7100 is equipped with a larger display that also boasts a higher resolution. So, you can say that the image quality of the display is better. However, the display is not a touchscreen and is fixed. Canon is aware that they can take advantage of these weaknesses. So, Canon 70D is armed with an articulating touchscreen display, albeit the size and resolution are slightly smaller. Its operation is generally more convenient; even if you don’t fancy the touchscreen, the articulating display is a nice feature for making tricky shots. Each of the two models comes with a pentaprism viewfinder. However, the one on Nikon D7100 is slightly better, due to the 100% coverage. The viewfinder of Canon 70D only has 98% coverage. Now, let’s take a look at the image sensors of Nikon D7100 vs Canon 70D. You see, both of them come with APS-C CMOS image sensors. But they have different pros and cons. Nikon D7100 is better because it has a higher resolution, which is 24 MP. It also has better low-light performance. The ISO range goes from 100 – 6400, expandable to 50 – 25600. On the other hand, Canon 70D has a resolution of 20 MP. Nevertheless, the performance at high ISO levels is better. The ISO range goes from 100 – 12800, and you can expand it to 25600. In general, both cameras here have good AF performance. However, Nikon D7100 holds the better edge. The AF system is quite more powerful, coming with 51 focus points including 19 cross-type focus points. The AF system is noticeably faster and more consistent. In addition, it has a center point autofocus at F/8 aperture. On the other hand, Canon 70D only has 19 focus points with 15 cross-type focus points. Nikon D7100 is equipped with a headphone port, which can be handy if you are going for video projects. It has timelapse recording. There are two memory card slots, so the storage capacity can be very much larger. The special feature of Canon 70D is the built-in Wi-Fi. You can use connect the camera to your smartphone wirelessly, and you will be able to control the camera remotely via your smartphone. As you can see, these two DSLRs have different pros and cons. Photography purists will value Nikon D7100 more because of the higher resolution and better AF system. The viewfinder is also better due to the 100% coverage. However, Canon 70D makes an excellent alternative if you need the usability at high ISO levels, articulating display screen, or built-in Wi-Fi.